This latest recital album by ‘the thinking person’s virtuoso: an extraordinary pianist’ (The New York Times) takes the listener on a journey through that most intense and absorbing of nineteenth-century obsessions, the night. The Romantic night was one without sleep, where experiences are mutated through darkness. Stephen Hough’s thoughtful programming creates a new aural sphere for some of the most celebrated piano works in the repertoire. 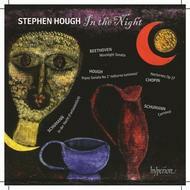 Hough begins with Schumann’s troubled, reeling ‘In der Nacht’ from Fantasiestücke, and continues with Beethoven’s ‘Moonlight’ Sonata and Chopin’s two Op.27 Nocturnes. With Schumann’s Carnaval we eavesdrop on one of the most vibrant parties in the nineteenth-century piano literature, with its panoply of brilliantly etched character sketches depicting both real people - such as Chopin and Paganini - and imaginary ones. Each movement is vividly contrasted - there are moments of unbridled ecstasy, elegant poise and elusive subtlety.